Established in the year 1994 at Bangalore, RAMPH(INDIA) is a leading manufacturer of Hydraulic & Industrial Equipments. we provide our clients with Hydraulic Presses, Hydraulic Fastener, Hydraulic Cylinders and many more. Large capacity of production, stock available and 5-10 ton material will be provide any time or immediately. These are widely appreciated for operational fluency, precision functioning and long service life. Our sophisticated manufacturing unit enables us to fabricate our range of industrial equipment as per the defined industry standards. We are able to design an advanced range of products under the supervision of our professionals. Our range is tested on well defined parameters like performance, design, energy efficiency and durability to provide the best quality range of products. Further, we also offer customization to meet the variegated requirements of our clients. We do exporting our products in England and importing from Germany. Under the able guidance of our mentor 'Mr. Krishna Kanamarlapudi', our professionals have gained expertise in this domain. Having years of experience in this industry, we are able to gain a strong foothold in the domestic and in the international market. Manufacturing and Trading of CLC Blocks Making Machines. Quality is our forte. We have a stringent quality control mechanism that helps in supplying the products which includes Pillar Type Hydraulic Press, H Type Hydraulic Press, Mobile Hydraulic Press, Hydraulic Nuts, Hydraulic Rings and many more as per the International quality standards. In our effort to deliver excellent quality products, our quality experts on continuous basis closely monitor the production and see to it that the quality is not comprised for achieving the higher production. Once the production is over, they are checked by our team of quality experts. The products are, after obtaining approval of the experts, then dispatched for delivery to the clients. We have the mission to provide different superior quality hydraulic products and equipment that are durable, reliable and meet the expectation of our clients and emerge as one of the key player for supplying quality hydraulic products. M/s Triveni Eng & Industries Ltd.
M/s S.M. 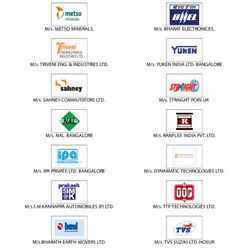 Kannappa Automobiles (p) Ltd.
M/s Bharath Earth Movers Ltd.
M/s Ranflex India Pvt Ltd. It is due to our efficient workforce, state-of-the-art infrastructure, customized solution, customer centric approach, ability to manage bulk orders and multiple modes of payment has helped us in gaining a remarkable position in this domain in such short period of time. We have set up a huge distribution network that ensures that the offered product range is delivered within the assured time frame at the customers’ end. Owing to our ethical business policies and transparent transaction practices, we have been able to win the trust of our valuable customers in the most efficient manner.